Please take a look at a selection of our work. Many of the homes on the new build estate of Augusta Park, Saxon Heights and Picket Twenty in Andover have unvented, pressurised cylinders. 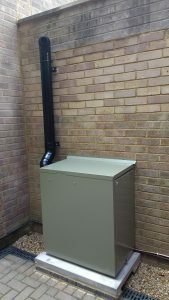 Most of these installations use a gas boiler as the heat source but some of these installations use an Air Source Heat Pump (ASHP). 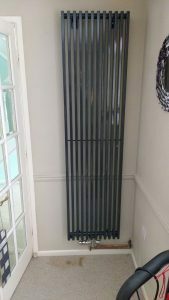 These ASHP cylinders are slightly different in that they have a larger internal coil but are around twice the price of their gas fired cousins! SHAPE Contractor recently attended the cylinder shown in the pictures. It hadn’t ever been serviced and had failed from the cylinder jacket. They are not repairable so it had to be renewed. They come with a manufacturer’s warranty but in this case it was void due to a lack of servicing. Please ensure it is serviced annually along with your boiler or ASHP to avoid large replacement costs. We can assist you with this so call us on 01264 748041. 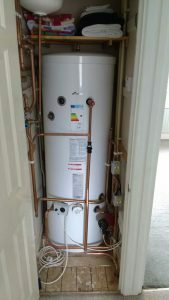 This house previously had a Grandee Wall Hung oil fired boiler. 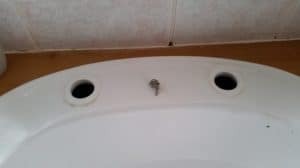 It had been problematic over the years but was suffering from a failed flue, spilling black soot in the utility room and intermittent burner lockouts. 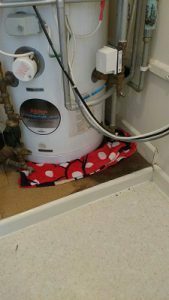 They decided to ‘bite the bullet’ and get a new boiler. We recommended a Worcester Bosch Greenstar boiler and Greenstar magnetic filter which was fitted. As a Worcester Bosch Appointed Installer, SHAPE Contractor can offer up to 7 Years Parts & Labour Guarantee on our installations. 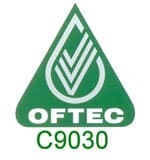 On Gas fired installations we can offer up to 10 years parts & labour GUARANTEES. We removed an old, inefficient boiler from the kitchen of this home. 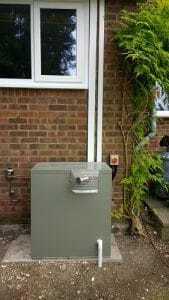 This freed up the much needed kitchen space and we sited a new GRANT (UK) Eco external system boiler. 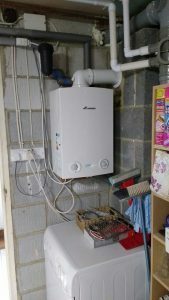 The new owner is extremely happy with their new boiler and it’s high efficiency resulting in savings on the cost of oil. Not only that but it comes with 5 year Parts and Labour Warranty as standard. We’re able to offer this extended period warranty as we’re Appointed GRANT (UK) G-One Installers. This picture shows a GRANT (UK) oil fired vortex pro external. It has the latest (BLACK) high level flue fitted. Previously it was only available in Chrome. We think the new black finish is a smart improvement. It was commissioned by ourselves. 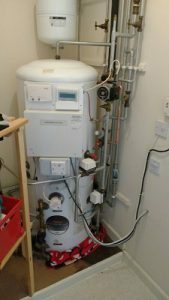 We removed an inefficient Gas boiler and standard cylinder. In place of those we installed High Efficiency Worcester Bosch Greenstar boiler and Pressurised Unvented cylinder. 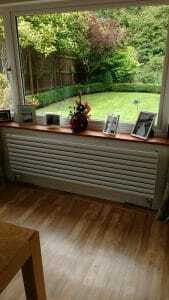 Some of the radiators were undersized for the rooms and in winter the homeowners never felt totally warm. We calculated the heat-load requirements for the rooms and they then chose gorgeous, designer radiators. White for the dining room, silver for the sitting/living room and polished chrome for the hallway. 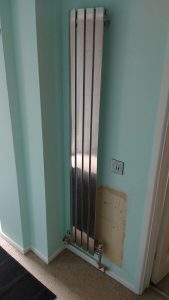 This radiator is dual purpose in that in can be used as a mirror when checking over before leaving the house. Please Note: One of the pictures shows marks on the carpet underneath the radiator. This was there prior to us working. We ALWAYS protect our working areas with sheets and leave it as we found it. 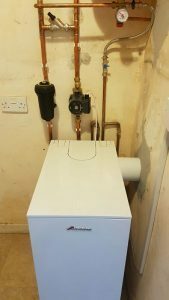 We installed a Grant Vortex High Efficiency External Oil Fired Combi Boiler with High Level Stainless Steel Flue at this customer’s home. The original boiler was situated in the loft! Quite a lot of work to get it re-sited but it was worth it. Customer is thrilled with their new investment. 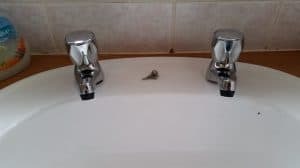 We renewed a set of limescaled and leaking taps in a rental property. Before, During and After photographs. 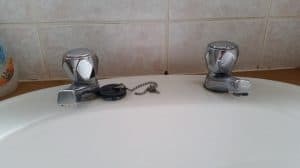 Sometimes it’s far more cost effective to carry out basin tap replacement rather than repair. 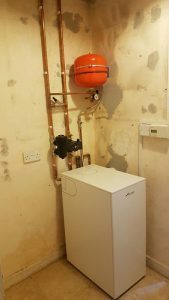 We installed a GRANT oil fired combination boiler in this property after the previous one had failed. In the picture you’ll note the large grey vessel above the boiler. There’s also a red vessel within the boiler. These are both expansion vessels for central heating systems. 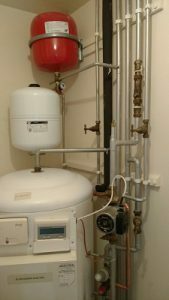 The role of an expansion vessel is to absorb the expansion of the hot water within the central heating system as it is heated by the boiler. If there’s not enough expansion vessel designed into the system then that pressure has to be relieved somewhere. If the boiler is constantly under a pressure it’s not designed for then that could result in premature failure of the boiler. Normally though, it leaks from connections on the boiler. So if yours is suffering from constant pressure loss and you’re continually filling the system, this may be an attributable fault. 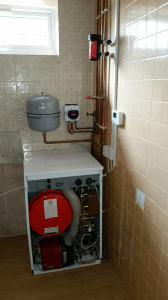 In our installation, we calculated the expansion within the system and recognised that the red manufacturer fitted vessel was too small for such a large house and added a further vessel. Also worth noting is this: An expansion vessel requires to be re-pressurised every annual service. If it isn’t, then over a period of time it loses it’s ability to absorb the expansion and may as well not be fitted…hence: More leaks! 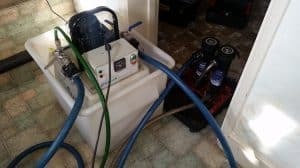 Chemical Machine power flushing is the ONLY way to effectively remove sludge and magnetite particles from your heating system. 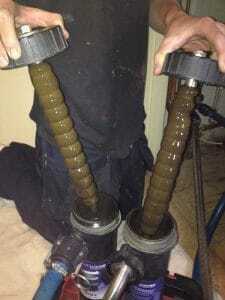 We used our Proflush heated machine and Adey Magnacleanse filters to remove this contamination from a domestic property. They’d been suffering from poor heat to radiators and cold spots throughout the house. Constantly bleeding the radiators was another side effect (gassing). We removed the sludge and installed a magnetic filter to remove future dirt build up. Refilled the system adding an adequate dose of a brand name quality corrosion inhibitor and balanced the radiators. 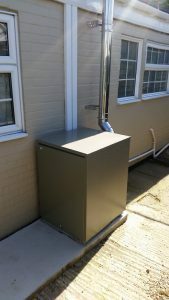 They were left with a fully functioning system and restored heating to the previously cold room.